How Many Ways Can You Use Online Courses To Grow Your Business? How Many Ways Can You Use Online Courses To Grow Your Business? How Many Ways Can You Use Online Courses To Grow Your Business? ​In the info-product world, it can be hard to think outside the box. But is that really all you can use Ecourses for to help build your online business? Heck no… allow me to show you the ways! Over the next few minutes, ​I'm going to share 7 great ways to ​use online courses ​to ​help grow your list, create info-products to sell, ​or even operate your business better. That sound interesting to you? Alrighty then… read on! ​Yup, using free online courses to help grow your email list is a solid strategy that isn’t going a​way anytime soon. Free Ecourses are one of the most high-value offers you can deploy on your site to entice new visitors to ​let you ​in to their email inboxes. Online courses give you the power to teach through a combination of text, images, audio and video. Compared to text and image only downloadables, this will boost the perceived value of the same information presented in an Ecourse format. ​You don’t have to wander very far from this blog post to find free online course lead magnets in action. In fact, all of our Thrive Themes lead generation offers are now in the form of high-converting, free online courses. 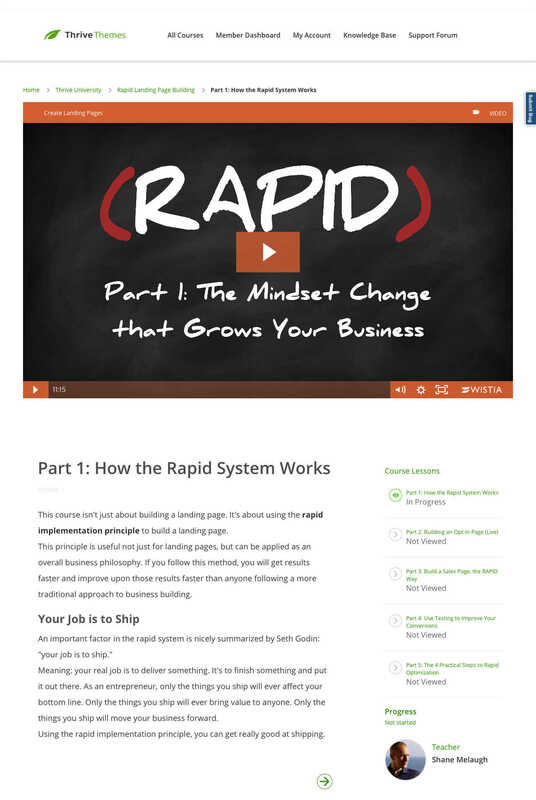 ​Screenshot of ​the first lesson​ from ​Shane's ​"R​apid Landing Page Building" ​Thrive University course built with the Thrive ​Apprentice plugin. ​If you’re already a Thrive Themes Member, by far the quickest way to build and launch a free online course ​as a lead magnet is with Thrive Apprentice. ​A ​Thrive Apprentice backend screenshot showing ​how you can easily organize your courses into Modules, Chapters and Lessons. 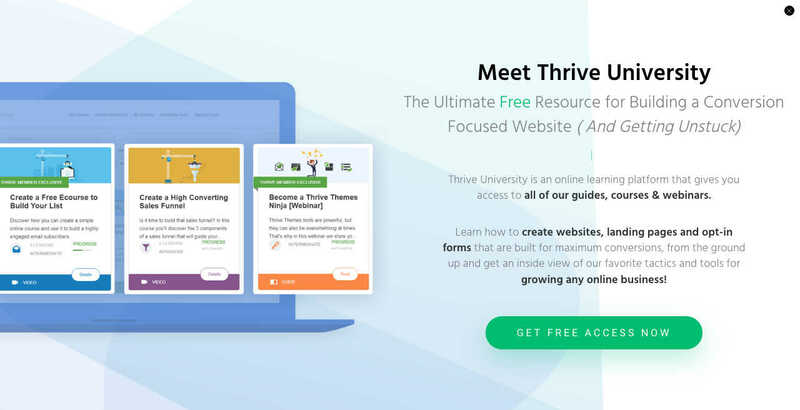 ​Without the need for any complex membership plugin​s, Thrive Apprentice gives you the content creation power of Thrive Architect combined with the Module-Chapter-Lesson structure most online courses provide. ​Screenshot of the default registration ​gate you can set up for any free online course you want to create through the Thrive Apprentice plugin. This gateway creates ​subscriber accounts ​through your WordPress site and sends the emails it collects to your email marketing service via an API link you establish within the Thrive Apprentice plugin. 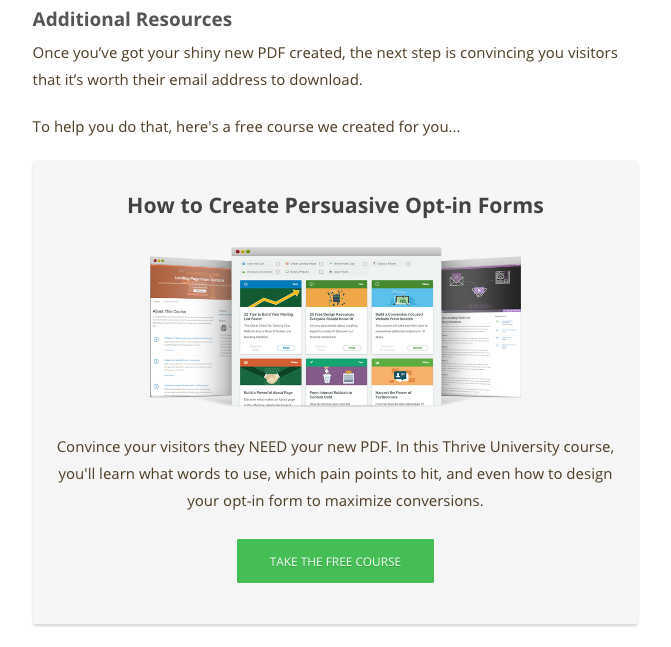 ​And once your online course is up and running, you can then drop promotional ​opt-in forms for it within your blog posts or use Thrive Leads lightbox popups across your site to get fresh eyes on ​it. ​Screenshot of a Thrive Leads lightbox popup we use to promote our own free online courses built ​using Thrive ​Apprentice. ​Screenshot of an in-content promotion ​for a free online course we placed at the end of a blog post that was closely related to the topic of the article. ​When most people think about online courses, this premium use case is the one that comes to mind most often. Paid courses offer a great opportunity to monetize your website because they require ​fewer operational costs​ to maintain and allow you to automate your sales and distribution systems when you’re ready to scale. The thing is that paid online courses are usually the hardest type of content to create since they must be worthy of what you charge for them. They also require the painstaking and often expensive task of setting up complex membership and payment gateway plugins on your website to make sure only paying customers gain access. But if you can learn how to level up your content value game from free to paid info-products while managing all the membership complexities, you’ll be well on your way to creating an info-product empire. ​​If you’re looking for some ideas on what ​good premium course content looks like, I surveyed the Thrive Themes marketing team to ​gather examples of courses we actually spent our own money on — and were ​happy with! 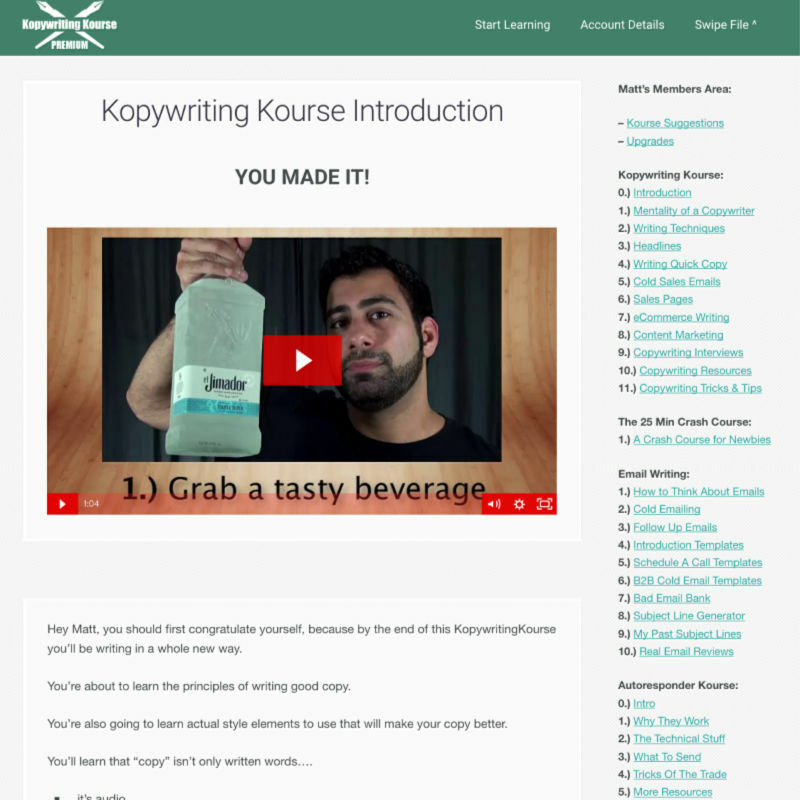 ​Screenshot of Neville's Kopywriting Kourse introduction page welcoming new students to his online course. ​​​I like this course because it’s quick to complete (about 2 hours long), super entertaining, and chocked full of valuable content. In fact, ​this course is what got me started​ ​in professional writing over 3 years ago! ​The course was a lot less expensive when I bought it back ​in 2015 (​$197​), but ​Neville has slowly add​ed new modules and features​ along with group training sessions (​a.k.a. “office hours”) ​so he now ​charges ​$497 for his ​basic package​. 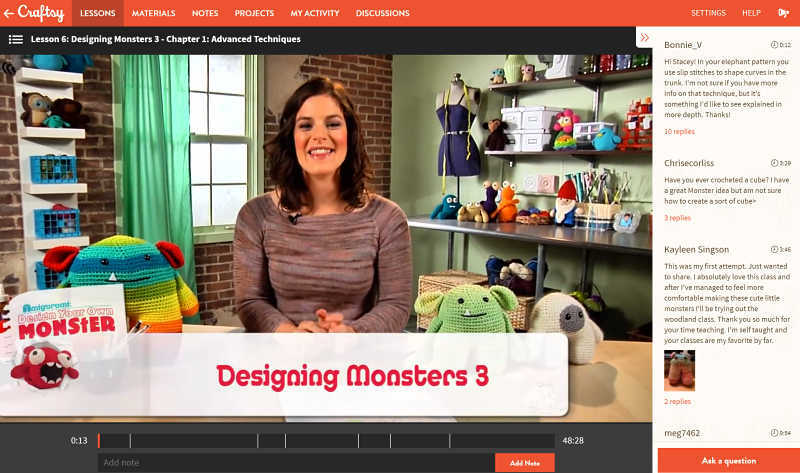 ​Screenshot inside ​one of the video lessons for the Designing Monsters online course. Designing Monsters, a video course on learning how to ​crochet wild creatures, ​is for sale on Craftsy.com. I liked ​this course because ​there was​ a very clear benefit: Learning how to design and create your own monster. Up until taking that course, I​ always followed online patterns to make my ​Amigurumi animals, but​ wanted to learn more ​about how to make my own designs​. Look, ​I'll admit that this ​wasn't a life changing course for me​. I’ve bought a lot of online courses in a wide variety of topics, but this example shows ​that you don’t need to make a $2000 flagship product to be successful. You can start ​by delivering a ​premium course that's quick and simple — just as long as you teach something others ​really want ​to learn. 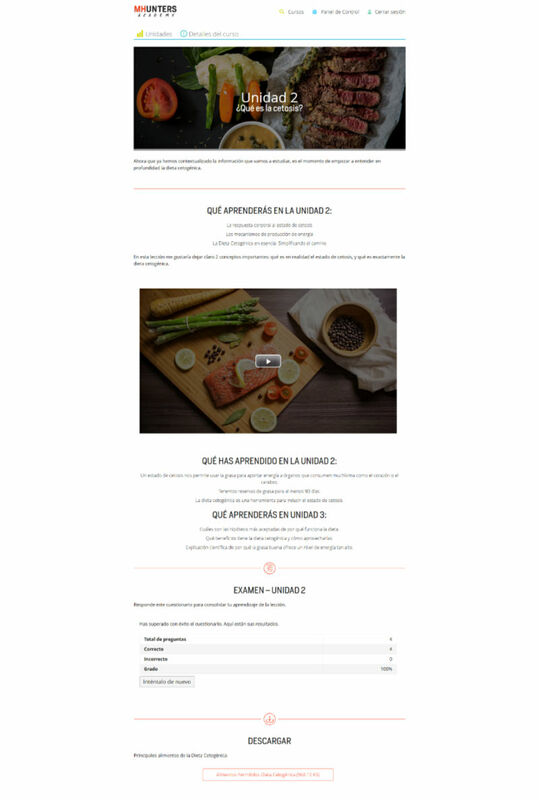 ​Screenshot from one of Mammoth Hunters' Spanish Keto Course lesson pages including video, exams and PDF downloads. I chose Mammoth Hunter's Keto Course because ​it really helped prepare me ​to learn about and ​take on the ​daunting ketogenic diet (​i.e. a daily ​food ​goals of 75% fats, 20% protein​ and 5% carbohydrate​s) with total confidence. ​​Because the training was available ​in ​both English and my native language of Spanish,​ that was ​very helpful to me as well. ​The course ​gave me 10 lessons ​that included videos, quizzes and downloadable ​PDF’s ​to educate ​me on everything necessary to ​start and follow through on ​such a ​restrictive diet. I liked ​this course because, even though the information is ​pretty nerdy, ​they ​made it easy to follow ​without ​ever talking over ​my head​ or using complicated nutritional ​jargon. I now feel like I have answers to anything you could ask me about the ketogenic diet so this course was a worthwhile $​100 for me. There are a number of ways to create premium online courses on your WordPress site, but they all have lots of cons associated with them. The easiest way to set an online course up is through platforms like Udemy and Teachable, but they end up taking different percentage cuts from your sales or charging you monthly fees to host your courses through them. We’re always wary of building businesses on OPP’s (Other People’s Platforms) so although this option makes things easier, it will also give you less control over your business. Alternatively, you can opt to create your premium courses through LMS products (Learning Management Systems) like LearnDash, but it’s complicated to set up and pricey ($199 for a single site license). Finally, you can create individual lesson pages for your paid Ecourses through WordPress (or Thrive Architect landing page templates like Idahosa did for his info-product business) and then bundle them all together and restrict access using membership plugins like Memberium or Wishlist Member to get the job done, but that can get messy and look bad if you’re not careful. The truth is that there’s not a very good solution to go with at the moment when it comes to selecting a premium online course platform for your WordPress website. Most of the options are complex, overly technical and downright expensive. Whatever solution you choose will likely frustrate you and lock you in for good since it will be too painful to start over with something else. ​If you’re an affiliate marketer or run an affiliate site, have you ever considered offering people free bonuses for purchasing the products you recommend through your links? If not, think about how much sweeter your personal recommendation for a product would be ​if ​it came with an enticing online course bonus​? ​​Amy Porterfield is an affiliate for Marie Foleo's online training program called B-School. Like any other affiliate marketing partnership, Amy gets a commission from the product creator (Marie Forleo in this case) for each ​customer that arrives through her affiliate link. ​Marie's B-School​ course has a $1,999 price tag which Amy likely ​receives a 50% affiliate commission on​​​. ​That means Amy has a massive incentive to ​encourage people buy through her link. 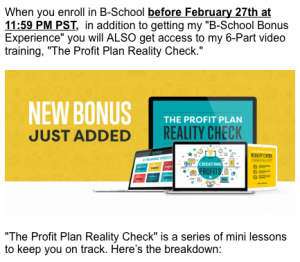 ​Amy Porterfield’s “Image of Profit Reality Check” bonus online training course for people that buy Marie Forleo’s B School copywriting course through Amy’s affiliate link. ​Talk about taking the pressure off! You can ​boost ​your affiliate commissions on already existing products that you recommend by making online bonus courses to sweeten your promotion ​of them. Instead of just taking your word that the product is ​great, this bonus strategy gives people added value ​when they purchase through your affiliate link. Another benefit of this online course use case is that it’s not as technical as you might think to set up (a.k.a. you don’t need a complicated membership plugin to do this). Build your affiliate product bonus course using the Thrive Apprentice plugin (currently available only to Thrive Themes Members). Ask people to send you the receipt of their affiliate product purchase via email. Cross-check their email and receipt with your affiliate commission report. Give them access to your bonus course by adding their email to ​the ​login gateway ​on your WordPress dashboard. Send verified customers their login details via a response email. If your business is still small and doesn’t have an overwhelming number of affiliate commissions yet, this is a low-tech way to create a simple membership site for yourself. ​​Before you decide to use this manual membership technique, ​assess the size of your affiliate commission​. It’s probably not worth ​doing if you only make $5 per commission, but definitely worth ​the effort if you’re making $1000+ per affiliate sale! ​Did you ever consider creating online courses to get your Virtual Assistants (VAs), Freelancers or Employees trained up in ​less time? Online courses are ​a great way for you to record, collect and organize your training materials in one place ​so new ​employees can ​learn quickly and start delivering value adding work. 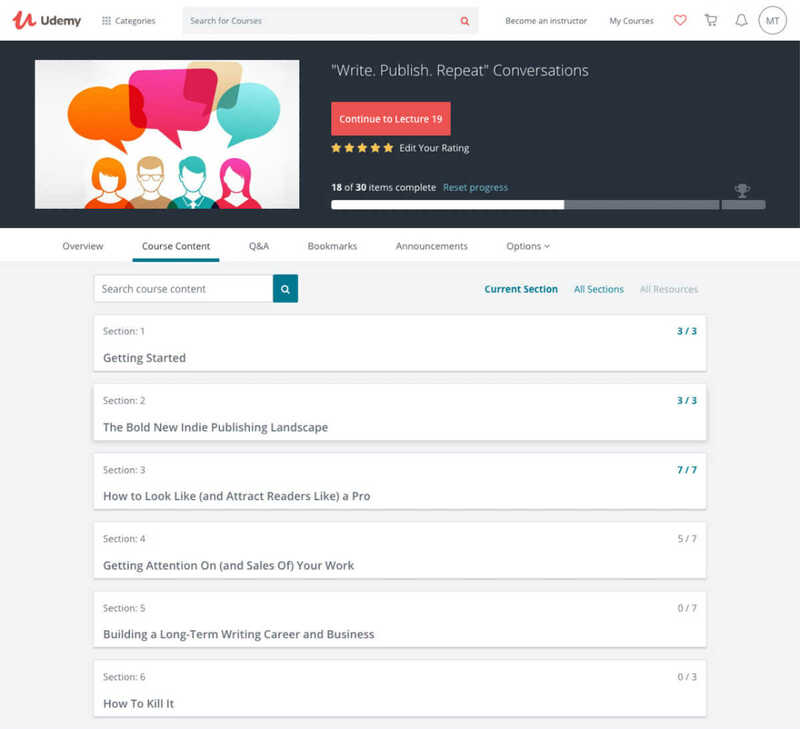 ​Screenshot of the internal Thrive Themes Onboarding online course for our Marketing Team. ​We​ created a series of courses ​for our new ​team members to complete before ​starting on publicly visible work. ​And​ because we believe in learning by doing, ​most of ​the course lessons ​include applied exercises ​to put the theory straight into practice. Using online course​s in this way helps to get everyone up to speed with how we do our work — as fast as possible. This also ensures that our new team members start delivering value adding work sooner than they might ​without any standardized training. Another benefit is that training materials are available at all times to team members so they can reference lessons ​whenever needed. ​If you’re ​now hiring extra ​hands to help scale up your business, why not create a separate training website for the exclusive use of you and your employees? ​I ​assume you already know how to build a WordPress website from scratch to do this, but if not, here’s a free online course to help you get that knocked out ASAP. 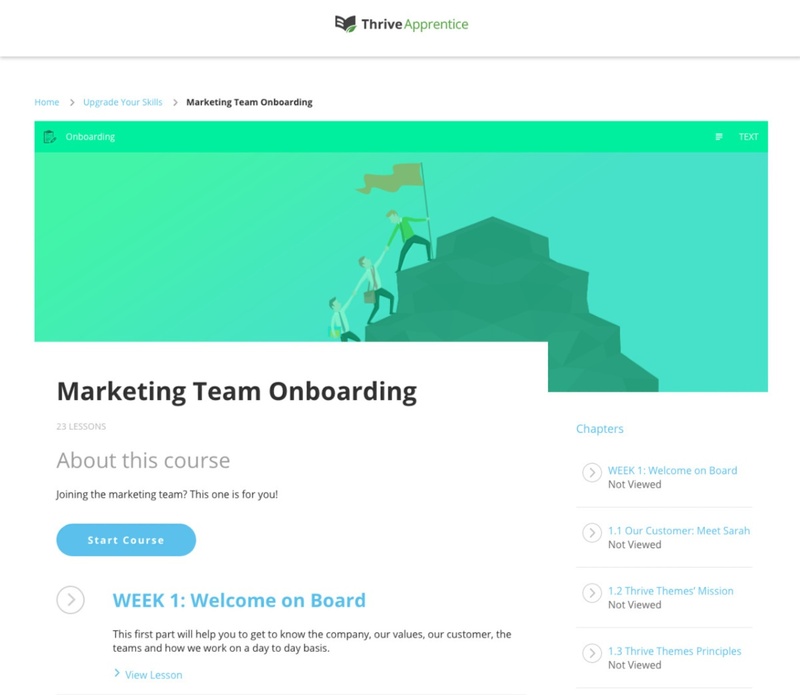 ​And if you’re a Thrive Themes Member, you can install the Thrive Apprentice plugin, create your new ​employee training course just like you would in the previous use case examples, but only make ​them available to the people that work ​for your company. ​In the same vein as the previous example, you can use online courses to help onboard your 1-on-1 coaching or business clients​. Often, it takes time and effort to get new clients up to speed with the way you coach or do business. Just think how many ​hundreds of times you've had to explain the same basic things to new clients before. ​Wouldn't ​your in person time be better spent helping them with their unique ​problems​? ​If you ​can explain recurring basics​ or frequently asked questions to new clients ​through an online course, ​they ​could learn the ​basics at their own pace and convenience. This would ​then make their 1-on-1 ​coaching time with you much more valuable. Within your onboarding course, ​you could also ask them to complete assignments at the end of ​each lesson before scheduling ​​their next ​call with you. This not only allows you to serve your clients more effectively​, but will also increase your capacity to ​take on more clients. ​The how to for creating onboarding courses for your clients will look similar to the new ​employee onboarding strategy discussed in the ​example above. ​​However, ​the one ​difference ​I recommend ​is ​to host ​your client courses on your main business site instead of a separate training ​domain. The reason for this is that ​clients are already familiar with and trust your main ​​website so sending them away to a separate URL ​might confuse them if ​its design ​isn't properly aligned with your main brand. ​Let me ask you, which sounds more desirable ​to potential employer​s or customers trying to ​gauge your authority and expertise in a niche? “Ooooo, a course ​creator! ​This ​gal must really know their stuff to actually be able to teach it!” thinks the person considering ​whether or not to hire you. In this way, online course creators now receive the same sort of ​prestige as non-fiction book authors and novelists do… everybody gets impressed when they hear ​you say ​what you do. You can use this expertise perception to your advantage by creating ​online courses around your expertise and making ​them available on your website. ​If you’re going to ​use online courses to boost your hiring ​and selling credentials, ​they should be located in a place where potential employers or customers can check ​them out. ​This means placing them on the same site you use to promote yourself and your services​. When deciding between creating free or paid online courses to help promote yourself as an expert, know that paid courses will carry more authority for you. Case in point, think about the perceived difference between an author that sells published books versus someone who’s only written free eBooks. The wow factor is quite a bit different, right? Ultimately, ​it’s up to you how much effort and value you’re willing to build into such a ​project, but at the very least, make sure the content is something you’re proud of and helps showcase your skills. ​If you’re a non-fiction author, online courses can be a great way to encourage people who ​complete your eBooks to keep learning from you. Well, especially if you sell your eBooks on ​digital publishing platforms like Amazon, ​many people ​will likely find and read your books without ever visiting your website. But if someone actually completes one of your books, they're prime candidate to join your site's mailing list. ​Help them bridge ​the gap between ​eBook reader and subscriber by placing a bonus link to ​a free online course (related to the topic your book was about) ​​on the last page. ​This strategy helps ​funnel hot leads to your website — I mean come on, they finished your book didn’t they?​ — to continue learning about ​your ​subject in ​Ecourse form. ​In an eBook titled “Write. Publish. Repeat.”, a trio of self-published fiction authors teach aspiring novelists how to write and self-publish their own novels. ​Screenshot of the last page ​in the Write. Publish. Repeat. eBook promoting the online course version of the book as a free bonus. This led Amazon Kindle readers like me — who bought their eBook due to a word-of-mouth referral — to eventually ​funnel into their free bonus course. ​Screenshot of the Write. Publish. Repeat. online course outline on Udemy. ​The course retails for $49.99 ​but is free for students that enroll ​through the bonus link placed in the back of their eBook. Watching their bonus course was all video lessons, I ​came to know ​and trust the authors better leading to ​my purchase ​of a paid course, becoming an email subscriber, and even ​buying some of their fiction novels. You ​could say I became a fan. But much of that customer relationship was fostered through the online course videos given to me as a free bonus ​at the back of ​an eBook. ​The easiest way to apply this strategy is to ​create an online video course version of your eBook and ​make it available ​to readers for free on your website and a paid course for ​organic visitors. 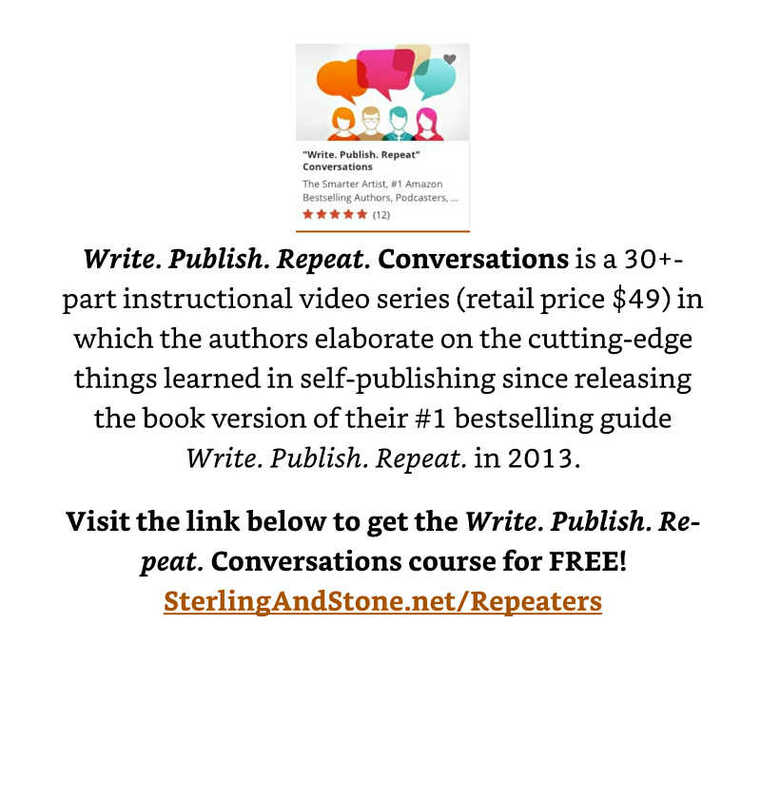 Simply promote the online course ​in the ​end matter of your eBook via a bonus link so readers who finish it will have a ​no-brainer place to go if they want to ​meet you “in-person” (a.k.a. video). If they actually ​read through your entire book, ​it's pretty clear that they’re keen to ​keep ​consuming more of your ​content, but an online course hosted on your own website ​will put you in the ​driver’s seat of the relationship​ by earning their email. ​I hope​ it's clear now​ that the ​range of ways you can use online courses to help grow your business is ​quite broad. The simple truth is that ​the online course ​is a powerful tool ​for helping you ​organize and ​teach information using a range of media formats (video, audio, images and text)​. Whether you​r ​students are paying customers, new email subscribers, new ​employees or new clients, ​you can leverage this ​technology to ​help them acquire the information they need. ​And if you do have a WordPress website already, I hope you’ll consider using Thrive Apprentice to help you ​launch ​one of these online course strategies quickly, easily and at minimal cost​. ​Do you have any other ideas about how you can create online courses to better grow, operate or monetize your business that we didn’t discuss above? Thank you for this article. It is very detailed and offers a lot of information on how to take advantage of Thrive Apprentice courses for my business. I an just waiting for you guys to drop your mentioned solution for selling courses using Thrive University. Any ETA on this? Thanks Alex… the ETA is very soon! LOL! That level of precision is baffling! I am really excited to hear that you will turn Thrive Apprentice into a membership course builder. Are you planning to include drip-feed features? Hi Shama, the Thrive Apprentice plugin will not have any drip-feed features, but the solution we’re integrating it with does. More to come on that soon! Could you say a word about HOW soon? I am just waiting for the upcoming black Friday in order to maybe register s.th. like Thinkify or Teachable, and maybe then I will be stuck there. Since I need a solution in the VERY near future… – HOW fast will be an announcement by Thrive Apprentice? Hi Paxpa, the new Thrive Apprentice deep integration is now available for Thrive Themes Members! Hi Matt. Like others, I’m very interested in the new Apprentice feature. I’m planning to launch a product in January and would be happy to be a beta customer. Is it weeks or months away? Hi Ben, the new Thrive Apprentice deep integration with SendOwl is now available for Thrive Themes Members! Thanks Ramesh! So glad to hear you found the additional use cases helpful to build the authority of your brand. Yes… watch this space Kendrick! Awesome ideas! The onboarding clients one will be great for my business. Sweet! Glad to hear it Troy! Ditto Matt! ;-) I’m with Shama & Alex — and probably at least 80% of your other Thrive Members — who are eagerly (and impatiently) awaiting an upgrade to Thrive Apprentice so we can build PAID courses! It can’t come too soon! Thanks so much for your comments Karen… glad the new client onboarding idea is a useful one for you! And the premium course solution is almost here… your (im)patience will soon pay off! Thanks for all those valuable info matt. One thing i want to add is, i already use thrive apprentice for my FREE courses and paid courses. I Just use woocommerce and our local payment gateway to do this which were both FREE. Thrive apprentice has a feature to hide courses for basic User roles for wordpress. So that was So seamless for me to setup a paid course with thrive apprentice. I already build an online business around this concept at my local country and it works like a charm. Again Thanks So much to thrive themes for all these useful tools. They changed my life. That’s awesome to hear Baris… thanks for your comment and congrats on your success! Good on you for your resourcefulness getting your premium course launched with WooCommerce + Thrive Apprentice and your local payment gateway… best of luck with growing your info-product empire! Thank you so much, Matt. I really appreciate the latest series of posts related to online courses, as I´m currently in the process of launching my own school using Teachable as the platform. Initially, I tried using Thrive Apprentice (which was perfect on itself) plus Wishlist member, to host everything within my WP site. As you mention in your post, this solution did not work for me, all because I couldn´t get the desired customization level with the wishlist product. So, in order to move forward, I took the jump onto Teachable. This is where I am right now. An online course It´s a lot of work for an entrepreneur like me (working solo), regardless of the platform being used. This is the reason why these are such great news! I have worked so hard that I´ve reached a point where I´ll continue until I finish my online school with Teachable. However, if Thrive Apprentice will soon be able to solve all my pains, I would be willing to start all over again, if by doing that I´ll gain 100% control over my courses, platform, payments, etc. May I suggest Thrive Themes and ThriveCart integrate efforts? Thanks for your comment Luis! Yes, I share your pain that all of the online course solutions out there are just incredibly frustrating and don’t give you the level of control you really need for your info-product business. Best to probably just stick with the solution you’ve currently chosen to get your course shipped and then worry about upgrading later instead of starting over again. Hopefully our upcoming solution will be what you’re looking for to bring full control of your course back onto your own online platform. Best of luck getting your course done and shipped! Thank you for your response and advice, Matt. Much appreciated. Thrive Apprentice for non-Thrive Theme members? Where do I sign?? Yes! Yes! Yes! I spent the past month experimenting with Thrive Apprentice, in combination with S2member and WP Affiliate Manager. I built two free courses, two paid ones. People can sign up for my affiliate program. Even my autoresponder is on my own blog, using Thrive Leads along with Mailpoet. I would never use a platform other than Thrive Themes. Thanks for sharing Peter! Glad to hear you’re having success with both your free and premium online courses using a Thrive Themes + 3rd-party membership plugin combo! Great ideas and I like where you going, but please make sure the product works first. After trying many times, I’ve never been able to get Apprentice to work on my site (The only thing that works is enabling and settings and yes, it’s up to date). It hasn’t really mattered since my courses were on another hosted site. I would like to migrate them back home, but it’s clear Apprentice is too unreliable right now to do it. I’m sure you can appreciate anything paid needs to be reliable. I pay $100 month for my course hosting. It may sound expensive, but it’s reliable and not clunky like so many WP plugins. Thanks for sharing Larry. Have you tried to contact support about your issue getting Thrive Apprentice to work on your site? One of the reasons the plugin has not been released publicly yet and only to Thrive Members is because it’s still in beta. If you reach out to our support team, hopefully they can help you resolve what’s keeping your courses from appearing on the front-end. does this mean if I as a member installed Apprentice V. 2.0.66 this is the beta version you are talking about and already has those new features, or is there some separate beta version I would have to install? No separate install needed. The SendOwl integration is now available in the most recent updates of Thrive Apprentice if you already have it activated as a Member on your WordPress website. OMG! I can hardly wait for the new secret thing :) from Thrive Themes. Sign me up already. Thanks Sande! The excitement builds… I can’t wait for the big release too! will there be a solution for pre built terms and conditions and other legal texts in English, German and other languages too? Will a student be making business with the school owner or with Thrivethemes? The purpose of Thrive Apprentice is for you to build your own online course school (which can now be integrated with SendOwl to cover payments, course access restrictions, EU VAT compliance and affiliate marketing). You’re in charge of setting your own T&C’s though Keno. This was great! Thanks, Matt! Best of luck with building your premium course! Great post. It looks like Thrive Apprentice is no longer available for sale. The Thrive remove it for a time? We never publicly released Thrive Apprentice for sale yet. However, we did release the plugin last year as a Beta for Thrive Members only. If you have a Thrive Membership, you can get instant access to the Beta right now. The public release and sale of Thrive Apprentice outside of the Thrive Membership is coming soon though! Thank you, Matt, very informative article. I am currently using Thinkific as a platform for a monthly fee of 99,- $ per month and very excited to see the Thrive solution. I want to create my digital expert brand by using online courses as an entry for new clients, and your idea of creating an onboarding course for new clients is precisely what I am going to implement. So thanks again and keep on going with the good work. Glad the article was useful for you through the expert branding and new client onboarding ideas. The premium course Thrive Apprentice solution we’re working on will definitely be much cheaper for you than Thinkific’s $99 per month subscription so more on that soon! PLEASE do tell us HOW soon? Is it within a few DAYS or within a few WEEKS? This would be important for me to know NOW, because then I would NOT have to register at Thinkific für §99 per month. I need a solution very soon now (customer is waiting). Hi Paxpa, the new Thrive Apprentice deep integration with SendOwl is now available for Thrive Themes Members. Thanks for your comments Rudy! Happy to say that an affiliate program feature will be available with our upcoming premium course solution. Explain, please, the difference between the plugin that already exists and the announced one? What’s now available is a Thrive Apprentice deep integration with SendOwl. SendOwl will restrict course access to paying customers, cover the payment processing, handle your EU VAT tax compliance and manage your affiliate marketing. Thrive Apprentice is the online course creation plugin we offer through our Thrive Themes Membership. We will release Thrive Apprentice publicly as a single plugin sometime in 2019. Thanks for this info. It’s timely. I am already thinking of how to use info here to help ad value to my client. Perhaps include building an employee or customer onboarding course site for my website development clients. Cheers Bassey! Good luck with creating the onboarding courses for your new employees and clients. Will it be available for none members too or only be available for those who bought a Thrive Membership? If it’s for everybody I’ll buy it right away! Can anybody help with my question? Hi Khell, the new Thrive Apprentice deep integration with SendOwl is now available for Thrive Themes Members! Hi Khell, the new Thrive Apprentice deep integration with SendOwl is now available for Thrive Themes Members. Sometime in 2019, we will publicly release Thrive Apprentice as a single plugin. This is super cool! Between the new theme builder and this, I’m loving all the updates you guys are rolling out. I do have a question- apologies if you mentioned it above. Say I have multiple courses available. Am I able to offer one-click upsells from the checkout page, or bundle all of my courses into a yearly membership? Not sure which route I’d like to go, but I’m planning for the eventuality. If you integrate Thrive Apprentice with SendOwl, you can bundle your courses. Thus far, the word “tax” is not mentioned once in these comments, or even on the entire page. I find this strange when what is being talked about here is a business solution. But, like death, tax is something that most people would rather ignore, but that does not make them go away. Sooner or later, you have to face up to them both. Products like Kajabi (good and easy to use, but very expensive) can have all sorts of integrations through Zapier, but, for actual payment of courses you are limited to using Paypal or Stripe, neither of which is a complete tax solution. You have to cobble together other services on top to achieve this, which all adds to the cost. Rightly or wrongly, I am assuming that the Thrive Themes paid courses product will follow a similar model to Kajabi as far as payment for courses is concerned. What solution, therefore, would you recommend integrating with your paid courses product for collecting, filing and remitting taxes worldwide? A Merchant of Record is a complete tax solution. They store your products on their servers, sell them as if they were their own, collect, file and remit taxes to the relevant authorities, and then pay you (less their fee) as if you were their affiliate. On the face of it, they are expensive, but probably cheaper in the long run. Two Merchant of Record services that I am aware of for selling digital products (including software) are FastSpring (who also have a WordPress plugin) and Paddle. I am sure there are others. But using either of these would sort of defeat the purpose of using a paid course product like the one in the offing from Thrive Themes. 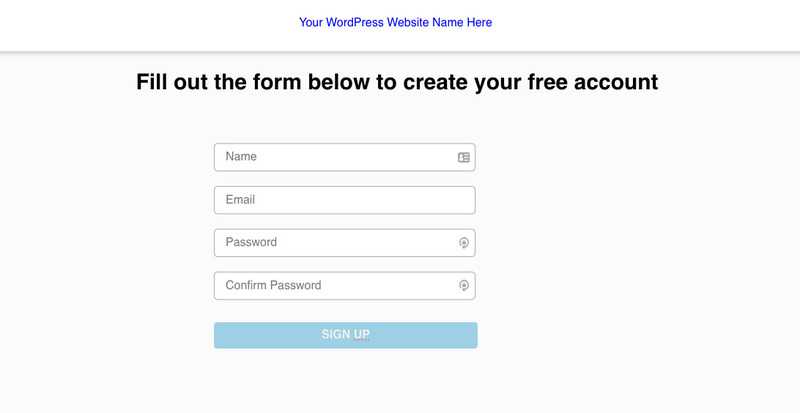 You could just use a vanilla WordPress site, with links to your products stored on the Merchant of Record site. A deep integration between Thrive Apprentice and SendOwl is now available to sell your online courses. Indeed, one of the biggest reasons we decided to create this integration with SendOwl was because SendOwl handles tax for you — including EU VAT MOSS — at a very affordable price. Will upcoming release of ThriveApprentice support SCORM content? If not, what needs to be done to enable release of SCORM content? Hi Bibhash, Thrive Apprentice does not support SCORM content. This online course feature is VERY interesting. Please let me know if there is any secret list I can be added to to find out more! Hi Daniel, the new Thrive Apprentice deep integration with SendOwl is now available for Thrive Themes Members… no secret list needed! Online courses are a great way to demonstrate your expertise and nature of them being on video helps you to build trust. Using online courses for customer onboarding is another interesting idea. Glad you found the post useful Laura! Are there landing page and other section templates targeted at promoting Thrive Apprentice created courses? I’m not seeing any. Thanks! We’ll be releasing some landing page and sales page templates specifically for helping you sell and promote online courses very soon Christa! I’ve just published my paid course on Thinkific and it’s working well so far. However, I really want to transfer it into my WordPress site, so I get complete control. 1. When will the new update to Thrive Apprentice be available? 2. What will you be recommending for hosting video as part of such as course? Surely not in WordPress itself? 3. Finally, will you be adding options to allow customers to pay in their own currency? 1. The Thrive Apprentice deep integration with SendOwl is now available! 2. We never recommend hosting videos through your WP site. There’s a range of options out there including Vimeo Pro and Wistia that you can use. 3. 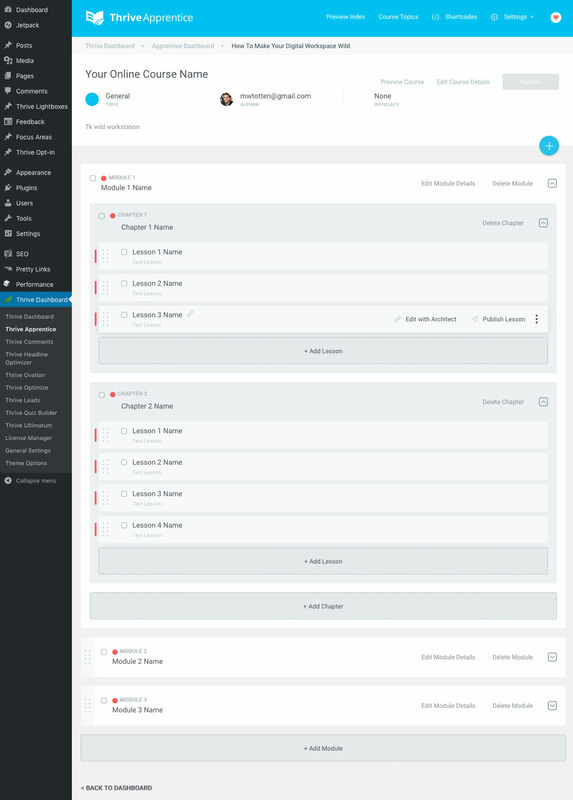 If you use the deep SendOwl integration to sell your Thrive Apprentice built online courses, the payment processing is done through SendOwl, not Thrive Themes. Best of luck selling your online courses! Thanks for another great article. I currently use a membership plugin and experience the headaches as many who are attempting to use the same plugin for both paid courses and memberships. I implemented Thrive Apprentice before and secured the pages with my membership plugin and experienced bots creating user accounts somehow and gaining access to course content in Thrive Apprentice. I opened a ticket with Thrive support and asked if there was a way to prevent individuals from creating their own account and gaining access to the content in Thrive Apprentice and was told there wasn’t, so I stopped using it. Sorry to hear about the bot attack you experienced. With our recent deep integration with SendOwl, you can now limit access to paid online courses only for paying customers while also offering free lead gen courses as well. So was it wrong to buy the memberpress plugin yesterday? Please answer fast I have a 13 day moneybackgarantee???? If you are a Thrive Member, then there may be a better solution for you, yes. We’ll go into detail on this on the webinar. I could not see it becausecin Switzerland it was 3 or 4 in the night??? ?Do you have a video? A replay will be sent out to our mailing list soon. I missed your webinar yesterday :(. Is there a replay anywhere for me to view it? I also a Thrive Member using memberpress without much joy and I’m uber interested in hearing what you have to say is a better solution. We are working on putting together the recording and some more info. We will mail out about this shortly.